The PLANES, TRAINS AND AUTOMOBILES Blu-ray features an in-depth retrospective on John Hughes’ career that includes interviews with those who worked with him and explores his indelible impact as a writer and filmmaker. Additional features include “Getting There is Half the Fun: The Story of Planes, Trains And Automobiles,” “John Hughes For Adults,” a tribute to John Candy and a deleted scene. 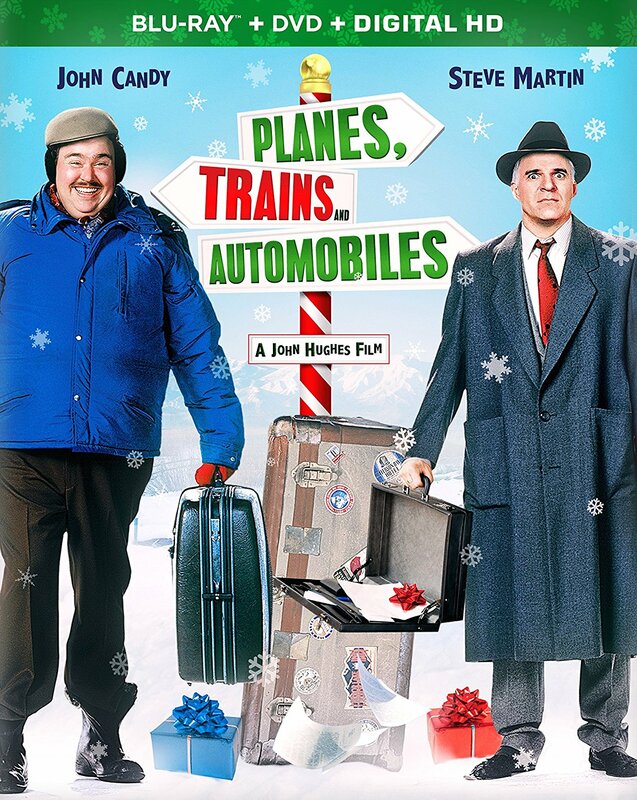 Purchase PLANES, TRAINS, AND AUTOMOBILES on Blu-ray Today! 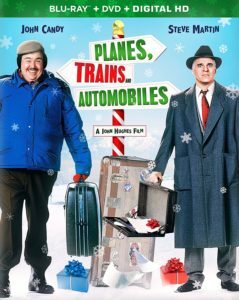 PLANES, TRAINS AND AUTOMOBILES is a story about one man named Neal Page (Steve Martin) trying to make it from New York City to Chicago to be with his family for Thanksgiving. Along the way he meets a very obnoxious fellow traveler named Del Griffith (John Candy). After their flight to Chicago gets delayed they must find a way to get to Chicago for the holidays. The two decide to travel together and there a couple road blocks along the way to say the least. This film was a first time, blind watch for me. Directed by John Hughes and starring great actors such as Steve Martin and John Candy I knew it would be a very enjoyable watch but I was blown away by how much I laughed throughout the film. It was one of those films that you watch and fifteen minutes in you regret it’s taken you so long to watch it. Steve Martin and John Candy were a fantastic pairing together for such a comedy. Steve Martin always has this certain dad trait whenever he has a role like this, where all he wants to do is make it home but he can never catch a break. John Candy is the best kind of obnoxious character when you are traveling that you never want to sit beside or have much interaction with. He stole this movie from the first time he appeared. This film definitely reminds me of the newer 2010 film DUE DATE. I feel like that film drew a lot of inspiration from PLANES, TRAINS, AND AUTOMOBILES. Obviously, DUE DATE was a little bit more modern and a lot more vulgar with the likes of Robert Downey Jr. and Zach Galifianakis being involved. I was kinda surprised to find out PLANES, TRAINS, AND AUTOMOBILES was rated R, that is up until Steve Martin had his F bomb filled rant at the car rental desk. That scene alone was gold. Overall, if you are in the mood for a holiday movie around Thanksgiving time then this is the film to watch. It is actually enjoyable for any casual watch if you are in the mood to watch two actors just having fun. This will definitely be a rewatch for me every year or two. It also makes you miss how amazing a comedy legend like John Candy was. Much deserved 8/10. The video is a 1080p AVC presentation that has its ups and downs. There are plenty of details in the images like the clothing. The patterns, lace edges and materials of the 80’s are all present. The skin textures are visible with facial lines showing. Small details like snowflakes on clothing are clear and show that this is a decent transfer. The coloring is bold but not overly bright so the picture looks natural. This is also seen in the skin tones. The blacks are deep and look great in the dark highway scenes. Sometimes you can see the edge enhancement that is way too powerful but its not way too much. It can leave some of the images looking a little waxy at times. The audio is a DTS-HD Master Audio 5.1 that does the job for this comedy. The center channel brings the dialogue leanly and clearly with most of the effects in the front and surround channels. The score and soundtrack have that 80’s drum kit beat and synthesizers that fill the room how only a John Hughes film can. There is also a lot of great use of ambient sounds in wherever they happen to be like the beginning in the city and the airports. 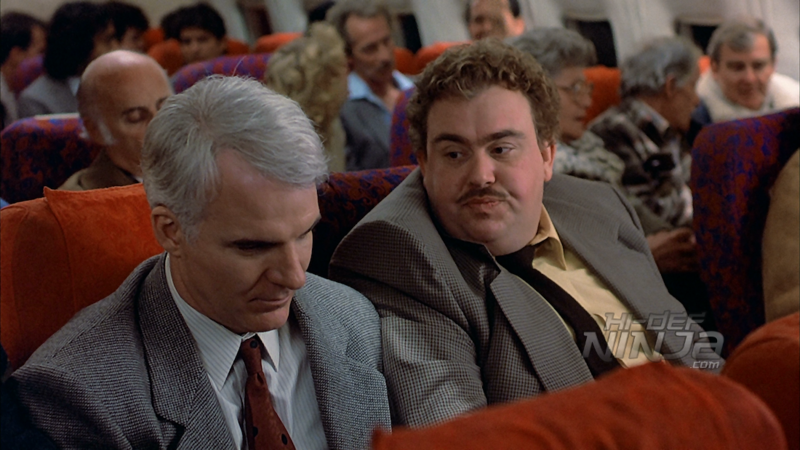 -Getting There is Half the Fun: The Story of PLANES, TRAINS, AND AUTOMOBILES: This is an interview with various news outlets with John Candy, Steve Martin, and John Hughes. With this are some interviews with various members of the Cast and crew. -John Hughes: Life Moves Pretty Fast: This is a two part extra that has cast, crew and friends discussing what they remember about John. Working with him and just knowing him. Its really a great extra included. -John Hughes for Adults: This looks at the movies he made that were aimed at adults rather than the teenage films that he did. -A Tribute to John Candy: Some of the cast and crew discuss how he was on set with the movie and his career. -Deleted Scene: Airplane Food: This is actually a funny scene that would’ve been great of it was left in the movie.